I read The Feast of the Goat not too long ago (click title for review) and I remember thinking how fear, shame and paranoia could spread through the oppressed and the oppressors for individuals in the moment and through generations over time. I have similar feelings about this book; it is a fictionalized account of the generations over time I was referring to. And I mention the Vargas Llosa because of the connection to Trujillo. 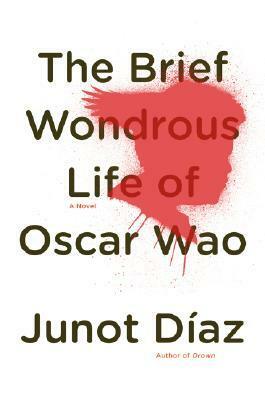 There are footnotes about Trujillo all over the pages of 'Oscar Wao'. Trujillo's legacy of fear and hate is unleashed upon Oscar and his family, and it has diffused into Dominican culture on the island and in the community in the States. While I feel Trujillo and things like fuku* are unique to Dominican culture initially, I believe they easily transpose to the American experience, and the struggle with identity many young people face at some point in their lives, or throughout their lives. Oscar is the quintessential example of this: an overweight, ghetto nerd, living and breathing science fiction and fantasy culture and wallowing in self pity and degradation...and his biggest affront--he lacks that famous/infamous Dominican swagger. Poor Oscar is not the object of female affection...well no romantic affections anyways. He's a minority within a minority, a subculture within a subculture. I realize this doesn't sound like much at first, but this preoccupation with love and affection goes deeper than what it appears at the surface. It's present in the love-hate relationship between Oscar's sister, Lola, and their mother, Belicia. Oscar and himself. Lola and her boyfriends. Belicia and her past. Belicia and her family in the DR, Belicia and her mother-figure, La Inca, La Inca and her family, the family and Trujillo, the DR and Trujillo...once again, it's the fuku and the angst of society at work. Many of the characters in this book have dealt with pain or abuse of some form or another, but Diaz is able to spin threads of humor and realness into the dialogue and narrative, so the read as a whole isn't bogged down with misery. It's filled with playful generalizations, semi-colloquialisms, muted violence, brief dream sequences of a golden mongoose...the 'n-word' is said a lot--on par with the level of usage in the movie Django. It is colorful melancholy and strangely personal (...for me anyways) And while the ending isn't a happy one, it was certainly appropriate. This book is wonderful. *fuku = curse, doom, superstitious powers, The Curse and Doom of the New World.